Woot! ALL SHIRTS CAN BE CUSTOMIZED! Flat-Out Love and Left Drowning shirts are ready for you! $25.50 each in sizes S, M, L, XL, and $27.50 for 2XL. These are *gorgeous* Bella brand shirts, all super soft with lovely, flowing and flattering shapes, printed by hand via my friend April. $6.70 for shipping for up to 2 shirts. You're looking at !) an LD watery teal with rolled-cap sleeves that hangs a bit lower in the back (ask for the rolled-cap shirt in teal), 2.) 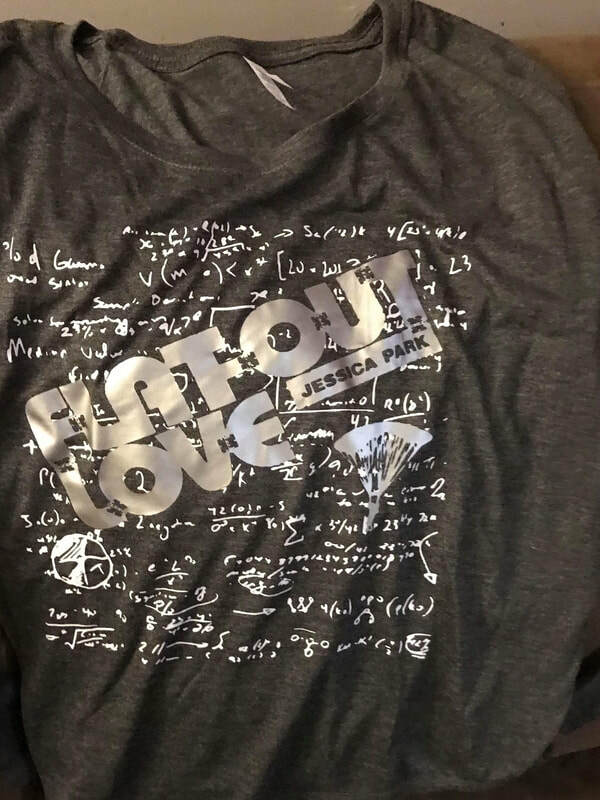 The long-sleeved FOL shirt in a dark gray fun scoop neck that can be worn off the shoulder, and it has a slight band at the waist and a Matt Watkins-themed math-y background in a silvery print. 3 and 4) A soft-drape sleeve. This is my favorite! SO fun and flattering! TO ORDER: Send an email to April at Punky Monkey Designs at Aprillakhbal@gmail.com letting her know what shirt style and quote you want and in what size. She’ll send you a PayPal invoice, and then you’re all set! Because she’s a local designer, her turnaround is only 2 weeks, and you're supporting a local artist! Flat-out love shirts in a draped shirt.